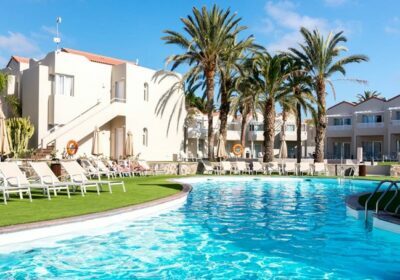 Hotel THe Koala Garden Suites, Free Child Places, Maspalomas, Gran Canaria. 4 star Hotel THe Koala Garden Suites recently refurbished to a high standard all facilities are very good. There are 6 swimming pools plus 2 children’s pools and splash pool. Spacious apartments with a double room, big bathroom, and big living room. Very hard working entertainment team. Buffet style restaurant for all meals. Food is excellent quality for the price paid. Breakfast is a mix of continental and English breakfast, with plenty of choices. Choice of hot and cold dishes for lunch and dinner. All Inclusive drinks are available from 11 a.m. to 11 p.m. Free bus to and from the beach. Very Good Value for Money. The suites are 2 km from Maspalomas Beach, 1.5km from the golf course, 1.5 km from the Palace of Exhibitions and Congress, 700 metres from the Faro II Shopping Centre and 1.2 km from Playa Del Ingles. The Koala Garden Suites are a complex located in the Campo Internacional de Maspalomas and offers comfortably furnished accommodation. There are 233 bungalows built across two floors (167 one bedroom, 66 studio). They are divided into five areas and each area has an individual pool. The bungalows benefit from a bedroom with twin beds, living room, telephone, air conditioning, safety deposit box (local charge), kitchenette (two cooking rings and fridge), private bathroom and balcony or terrace. The complex has one buffet style restaurant and a pool bar. There is a sauna, gym and sports court (charges may apply). Guests have access to a 24 hour reception. For kids, there is a playground and mini disco (subject to occupancy/seasonal). The complex offers a selection of outdoor swimming pools with loungers.